It appears that many people are trying to use Gallery in a ftp-only remote access environment. This can be tricky because you don't have the ability to change the web server environment, nor do you necessarily have special privileges. To top it off, you can't run the configure/secure shell scripts remotely. Hey all. Chris has implemented style sheets and headers/footers that allow you to heavily customize the look and feel of Gallery. 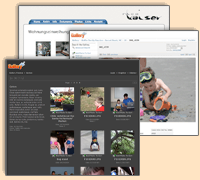 You can embed the main gallery page inside your existing website with seamless integration. The production release of PHP 4.0.4 fixes both the serialization bug and the upload timeout bug that were introduced since PHP 2.0.2. I've done some preliminary testing with 4.0.4 and it appears to be solid. Many users have been reporting problems with Gallery locating NetPBM on Linux. These problems stem from NetPBM being installed into its own directory instead of one on the path of the webserver user. In general, that's a good thing since NetPBM has a ton of files. PHP 4.03 introduced a bug in the serialization code that causes Gallery's database files to be corrupted. :-( They fixed that bug in 4.04, but in the development versions of 4.04 they introduced a new bug that causes you to be unable to upload zip files! AIEEE!